Angie Larson has designed and installed window treatments in upscale homes for the past 20 years. As the owner of Larson Drapery & Blinds LLC, she has become a trusted resource regarding custom drapery and window covering services for residential and commercial clients, such as hotels, nursing homes, hospitals, offices, government buildings, and more. 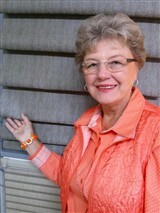 A showcase Hunter Douglas Dealer, Angie is noted for her attention to detail and her strong customer service skills. She takes pride in going above and beyond for her clients to make their homes or workspaces beautiful. Angie is excited to announce that she has invited Kim Song, owner of The Garden Shed and a renowned local florist, to keep a cooler of her flowers in the Larson Drapery & Blinds store. Therefore, customers will now be able to shop for fabrics and flowers at the same time. Angie believes that this will enhance the retail experience for consumers, as fabrics, florals and decorating are a winning combination.